Captain Phasma and Count Dooku battle Han Solo and Luke Skywalker in the Jedi Temple on Coruscant. Jango Fett and Jabba the Hutt attack Rey and Finn as they pass through the frozen wastes of Starkiller Base. 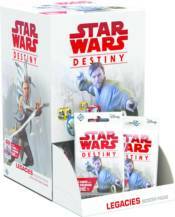 Play out your own epic, saga-spanning, �what if� battles in Star Wars�: Destiny, a collectible dice and card game for two players! In every game of Star Wars: Destiny, you�ll gather your small team of iconic characters and battle to defeat your foes, using your dice and the cards in your deck. The last player with characters left standing wins the game, but to successfully outmaneuver your opponent, you�ll need to carefully consider your options and enhance your deck with new dice and cards. If you ever wondered who would win a duel between two teams of heroes and villains from the Star Wars universe, there�s no better way to find out than with Star Wars: Destiny. Blind bag packaging. Sold individually.